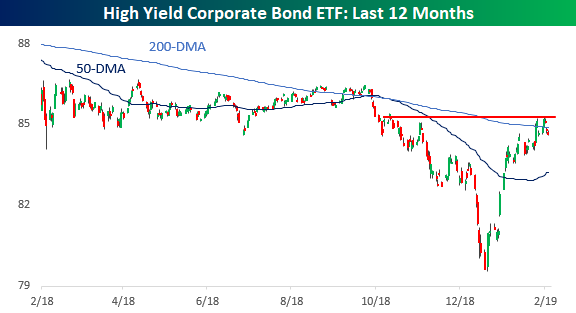 Just like the broader market this week, the rally in high yield credit stalled out a bit. Earlier on Friday, we highlighted the fact that the S&P 500 ran into resistance right at its 200-DMA earlier this week and has been pulling back ever since. In the case of the ETF that tracks the high yield credit market (HYG), we have seen a similar setup. Coming off the lows in December, high yield was a little bit late to the rally, but it quickly made up any lost ground and has since followed the move in the S&P 500 step for step. In fact, this week HYG even managed to briefly trade above its 200-DMA. In this case, though, HYG ran out of momentum pretty much right at the same spot (~$85) where recent bounce attempts also ran out of steam. The fact that these rallies in both high yield and the broader equity market are stalling out right at key moving averages is no doubt a focus of technicians, but given the magnitude of the moves off the lows, they had to take a break at some point, so why not at a point where everyone was expecting it. The only test now is whether there are enough bids below current levels to support the market, or will sellers eventually overwhelm the balance.